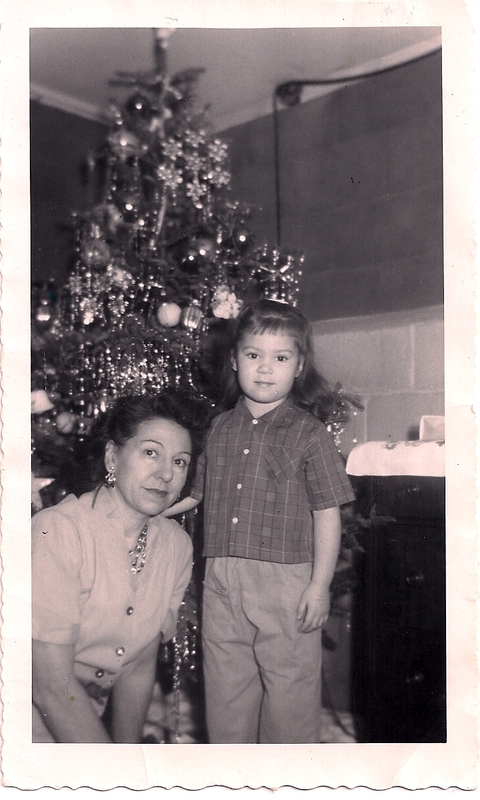 Here is a photo of me and my mom, December 1956. I am four and she is forty-four. Notice where my right arm is. My hand rests on my mother’s back. Had I felt the need to reach out to her? Maybe the picture taker prompted me. I know my mother didn’t. She is unto herself and prided herself on her independence. Her hands, out of view, seem to clasp one another. She leans a bit forward and I lean back. Our bodies are close but not touching, save for my hand on her back. My mother has PTSD and so do I, but neither of us know it. It wasn’t even a diagnosis back then. The tree, with all its ornamentation, seems to grow up out of us. Of course, the tree is still green because the base of the chopped trunk sits in a pan of water. Perhaps the dying tree is an apt symbol for PTS, for it interrupts growth. Certainly, my mother and I had a complex and often difficult relationship. I come from a long line of PTS parents. My mother was beaten or “stropped,” as she called it, by her father as a child. She told and retold the story that her brother, Harold, shared with her when she was older, as he was witness. When my mother was two years old, her mother was holding her and her father whacked my mother’s face so hard that her nose bled all over the new white Easter gown she wore. The family had been on their way out the door to go to church. Tears emerge as I remember this story. Poor Mom. And so I reached out to her as a little girl, for she had already told me this story and many other such grim tales. Of course, she shouldn’t have but she, in fact, couldn’t stop telling them. She had PTSD. Believe it or not, according to my mother, her father had been hung from his thumbs as a child by his father, a Methodist minister. Apparently, there was a trap door in the kitchen that opened into the root cellar and when little William Henry was “bad,” he was hung in the dark. When his first born son died at age three from a high fever, my mother told me that her mother claimed he had changed. First he plunged into depression and isolated himself. When he re-emerged, he was angry, cruel, and controlling. One could say that my mother’s father’s PTS parented her and then her PTS, me. Does any of of this stress, transmitted over the course of a century, have to do with creating a restriction (pyloric stenosis) in my gut? The cause of pyloric stenosis (ps) is unknown. Might stress have been a factor? Large amounts of stress hormones in the blood of pregnant women can negatively impact their fetuses (Sapolsky, R.). In any case, Post Traumatic Stress is a serious challenge to healthy parenting and the more we are hip to our own symptoms and behaviors that result from PTS, the more likely it is that we won’t pass it on. Love this. We have much in common my friend.. Hugs! Hugs needed and appreciated…..as you know :). Thanks! on February 29, 2012 at 7:06 pm | Reply Maura S.
This really strikes a chord in me. We know now that stress is a teratogen and that the cortisol that washes over babies in utero can have a long-lasting deleterious effect. But in addition, PTSD can be passed down through the generations by peoples’ actions and attitudes. My grandfather came home from WWII with a violence simmering within that was greater than the size of his small body. He brought the war home with him, and waged it upon his children. And his children waged it upon their children, in turn. His PTSD started in the war. My mother’s PTSD started at home and continued through the violence she encountered throughout her formative years. My PTSD began in the home and blossomed through the violence I was subject to at school and in the big, bad world. In fact, much of the harm I came to can be attributed to a lack of self-respect that began in that toxic, bellicose home environment, which drove me to court self-destruction. There are telltale signs on my body that I was exposed to stress hormones in the womb (and my own mother was never one to avoid stress when she could jump right into it), but those are nothing compared to the stress hormones that I was exposed to after birth. It’s a lifelong process of navigation, isn’t it? Absolutely. I’ve come to realize that PTSD is my teacher. If I listen to its messages, it shows me where I need to heal. I am constantly on the Freedom Road as I follow the signs. your life and background history seems like domino tiles falling. even though you might think that your mother might had not needed you. but with your hand on her back. she knows you are there for her, and she’s not left alone. Yes, and then I took care of her in her later years until her death. A full circle. I know how it is, I used to get a beaten all the time. I grew up in a very tradition family. So beating your child was very strong in our family while growing. I like how you described the photo of you and your mother. It’s a very good analysis of the photo. I’m so sorry that you had to go through that. I like your picture expression, it tells a lot. I am stunned by your stories. Since I come from a country where people did not express themselves so openly and were taught to hide their bad life experiences, I am very impressed. I believe that my husband had PTSD after the war but he never shared it with the doctor. He used to say:” I am my own doctor” (actually he was a veterinarian.) He likes to share his stories with us, his family, for whom it is difficult to hear about his experiences. When I was younger, I might not have shared my stories so openly for fear that potential employers might see my posts and think me unstable and hence, not hire me. Now that I have had stability in my career, I have to put caution aside in the hopes that someone will get help from hearing my story or reading one of my posts.